Keeping your “financial house” in order is a complicated, time-consuming and life-long project. There are a lot of risks and opportunities to consider, and many find the challenge overwhelming. Am I on the right track? What am I forgetting? Am I truly succeeding? The stakes are high – your family’s quality of life now, and in the future (for generations), is, in part, dependent on how “tidy” you keep your financial house. So, what should you focus on and what matters most? This is where the “Sound Financial House” comes in. It is designed to help you get and keep your financial house in order. You build it from the ground up starting with the most important “stories” at the lower levels. You want to get those right before working your way to the top, otherwise those stories may not matter because they’re not adequately supported. Also, don’t get caught up in focusing on only one, or just a few stories, and miss the fundamental importance of each level. Each story doesn’t have to be perfect before working on the next one, but it is wise to get an adequate plan in place for each level as soon as possible. Now, it’s time to start building your financial house and the first thing you want to do is lay a solid foundation. Foundation: Handle cash flows sensibly. This includes properly creating and managing your income and expenses. Without a solid foundation of cash flow management, you can’t have a Sound Financial House. In fact, nothing can bring your financial house down like building it on the sand of overspending and nothing can make it stronger than building it on the rock of earning, spending and saving wisely. First level: Protect from major risks. This includes things like lost income due to an injury or death in the family. Having personal property damaged or stolen is another significant risk. Insurance policies can protect you against these circumstances. Second level: Minimize taxes. Taxes will probably take more of your income over the course of your life than anything else. It is critical to not make any major tax mistakes because they could wipe you out; so, keep your tax burden as low as possible. Taxes matter – a lot! Third level: Use debt carefully. Borrowing money is a double-edged sword. If you borrow right, you can grow your wealth faster and increase your standard of living. If you borrow wrong, you may never achieve the wealth you desire, or worse, you could lose great wealth very quickly. Use credit cards, mortgages and business loans carefully. Fourth level: Plan your future. This includes planning for the next year, the next five to 10 years, retirement and beyond. For many, your financial house will continue with your children and grandchildren after you are gone. The better planning you do now, the more sound your family’s future financial house will be – both in retirement and for generations to come. Make sure you have your estate plans documented, in order and accessible. Attic: Invest wisely. You might be surprised to find that the attic – the seemingly least important level of the house – is invest wisely. Many people put too heavy a focus on getting their investment strategy perfect before they focus on the more important levels below. For those who have the rest of their house in order, investment strategy does become the most important level – but not before. The best investment strategy in the world can’t protect your wealth from overspending, overborrowing or many other challenges your financial house will face. Pillars: Knowledge and Action. 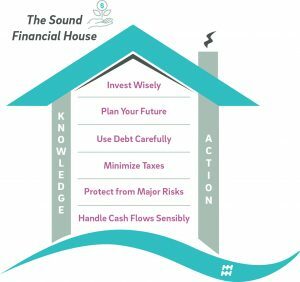 Finally, the Sound Financial House is supported by these two principles. You can’t keep your finances in order if you don’t have proper knowledge about how to effectively handle your risks and opportunities, and if you don’t sustain a focused and disciplined effort. Many people don’t have the knowledge, the discipline or the time to do all the work on their family’s financial house. If you need help, a capable and caring financial (house) advisor can be invaluable. You probably don’t do all the cleaning, repairing, painting, roofing, electrical, HVAC and plumbing on your physical house. For many, it makes sense to get help with their financial house, too. Take some time to let this foundation set and email me at MichaelC@hh-wm.com if you agree or disagree. If you like this post, send it to a friend. If you hate it, send it to an enemy!